You’re paying for electricity. 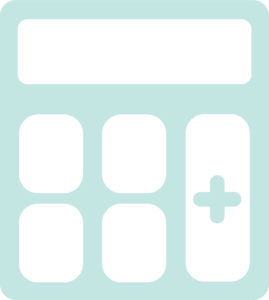 Now you can choose how it’s generated and what you pay. Residents and businesses in our service area with existing PG&E accounts are automatically enrolled in SVCE’s GreenStart electric generation service. You can also choose to upgrade to GreenPrime or choose to remain with PG&E’s generation service. SOLAR CUSTOMERS: Please see our rooftop solar page for more info about your enrollment schedule and Net Energy Metering choice with SVCE. GreenStart is SVCE’s competitively-priced, standard electricity offering. All customers are automatically enrolled in GreenStart, with electricity generated from renewable sources such as wind and solar and carbon-free sources such as large hydropower. *Sourced from wind, solar, hydro and other renewable energy sources to meet the total annual demand of SVCE customers. Choose to upgrade to GreenPrime, SVCE’s 100% renewable generation service, and be at the forefront of our community’s commitment to a clean energy future. GreenPrime is generated from 100% renewable, carbon-free sources, primarily from solar and wind farms in California and on the western grid. Buying GreenPrime further expands generation from these new and competitive renewable energy sources. GreenPrime is available at a premium of less than 1 penny per kilowatt-hour. For a typical residential customer, that’s less than $5 a month. As a customer, you can choose “GreenPrime, Anytime” after you’ve been enrolled in GreenStart. For a complete list of the resources included in GreenPrime or to view highlights of the conditions of your subscription, see the Power Content Label and Price, Terms & Conditions. Choosing GreenPrime can help your business meet additional renewable energy goals and help qualify you for prestigious certifications. If you have solar generation installed at your home or business, you can earn credits for the renewable power you generate and offset some or all of the charges you would normally pay for using electricity. SVCE’s Net Energy Metering (NEM) program pays higher rates for surplus electricity than PG&E does. If you already are a NEM customer with PG&E, your account is automatically enrolled in the SVCE NEM program. PG&E will true-up your account at the time of your enrollment. 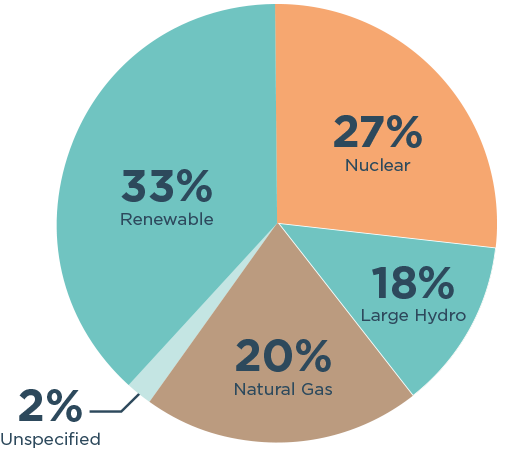 PG&E’s 2017 energy supply mix is nearly 80% carbon free, with almost half (33%) coming from renewable sources (information for the pie chart is from PG&E’s most recent 2017 Power Content Label). If you’d like to opt out of SVCE and choose PG&E power generation service, just complete the opt out form. And if you later decide that SVCE really is right for you, we’ll be happy to welcome you back. If you have any questions or difficulties with the form, please give us a call directly at 1-844-474-SVCE (7823).